Dog lovers rejoice! 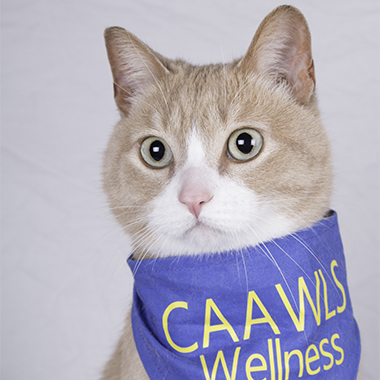 Dogs in the Library is back in session and we’re introducing an exciting new program for campus cat lovers. 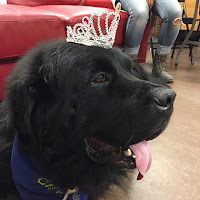 UAlberta Libraries is once again partnering with CAAWLS for Dogs in the Library. Together we're also piloting the new feline-centric Cats in the Library. As a sneak preview, meet a couple of the dogs and one of the cats you might see around our libraries. Hi, my name is Percy. I’m an 8 year old Labrador Retriever-mix who’s spent the summer running, swimming, indulging in my favourite snacks (peanut butter and carrots, if you’re curious) and taking long naps. When I’m a really good boy my family will let me watch my favourite movie - Homeward Bound. I’m looking forward to making some return visits to the library where I hope to get a few armpit scratches (I love a good armpit scratch!) and show everyone who’s a good boy… Don’t be shy in telling me if you think I am! Hey everyone! Presley’s the name and drooling is my game. My descendants are from Newfoundland, but I was born in Saskatchewan nine years ago… Gosh, has it been that long... I still feel like a pup! Except when my mom plays fetch... Then I let the other dog I live with have all the glory. Don’t let my size fool you (150 lbs), I’m just a big softy who loves getting plenty of hugs and kisses. I’m kind of like Dug, the dog from Up... I love that movie! This is the best time of year; the apple tree in my yard is full of apples that I can snack on and I get to visit the libraries again. Wow… I like the looks of that Presley guy, and Percy has great taste in movies… Oops, sorry... I got distracted. I’m Gus the cat. It’s my first time working at the library and I’m super excited. Are there any birds at the library? I love birdwatching almost as much as I love my kibble and sleeping. Sometimes for a treat my family lets me eat wet food… A little slice of heaven. I’m also a sucker for cardboard boxes and big dogs. Here’s hoping for lots of cuddles and no baths or showers when I visit this fall! Excited to meet these guys and their many friends? 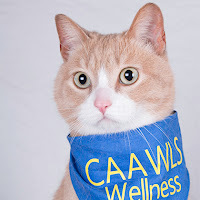 Here are the dates and times where you can indulge in some canine, or feline, love. 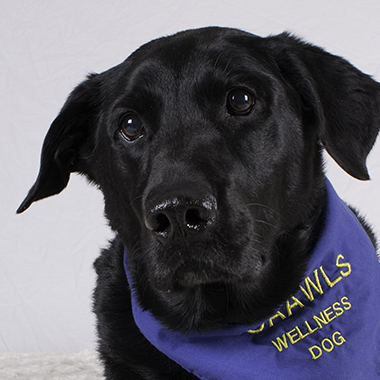 Augustana students, never fear, Hutch the library dog will be keeping his usual hours at the Augustana campus library. We encourage everyone to share their dog and cat selfies on Facebook and Instagram: #CAAWLS, #dogsinthelibrary, and #uofalibraries. We’d also love to see them in our Twitter feed, @uofalibraries.